The Joomla! Sales Analytics Reporting System (SALES ANALYTICS) displays the most relevant reports for your Joomla! based online shop. With its 286 different types of reports and its 4 different time frameworks (Days, Weeks, Months and Years), it provides the most detailed view on what's going on on your online shop. Sales, Products, Orders, Customers, Locations, Taxes, Shipping ... all the valuable information available is shown to you in the most friendly manner, every report combining an easily readable graphical display for quick interpretation, and a detailed matrix data for deeper inspection. Using SALES ANALYTICS on your online shop, you'll get to know exactly what need to be done, where and when. No more valuable data lost in the deeper side of the database. With this out-of-the-box solution, now it'll be all in your hands. You only need to install it, and you can start using it right away (no further configuration required). Products: how sales evolve for each individual product, sales percentages, top-sellers and so. Orders: what the orders status are, whether sales are completed or not, and if not, where they quit. Customers: who are your most usual customers, and how many orders and items have your customers submited. Location: where do your orders come from. Manufacturers: how manufacturer products behave, and indiviual sales reports for each manufacturer (gross income, net income, taxes, locations, top sellers ... per manufacturer). Inventory: how is the online shop inventory, what is the product stock and projections on when products will be out-of-stock. Taxes: what taxes are your customers sending to you. Shipping Cost: what are your shipping costs and where are you shipping the products. Vendors: (still beta in VirtueMart 1.1.x) how vendor products behave, and indiviual sales reports for each vendor (gross income, net income, taxes, locations, top sellers ... per vendor). Gross Income: the total amount received in online transactions. Net Income: the net amount that goes to the shop (skipping taxes ans shipping costs). Taxes: the taxes associated to the online transactions. Shipping Costs: the shipping costs to send products to customers. Shipping Taxes: the taxes associated to the shipping costs. # Orders: the number of orders on the online shop. # Items: the number of items sold on the online shop. Coupon Discount: discount associated with discount coupon codes. Order Discount: other order discounts. Every report also includes a set of header buttons indicating global amounts and values relevant to the correspondent report. This way the specific data is displayed together with the global data, so preliminar analysis based on the displayed data can be achieved quite straight forward. 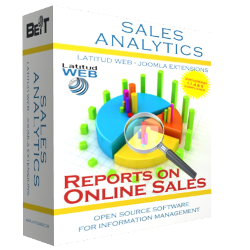 The combination of report types and sales parameters probably makes SALES ANALYTICS, the best reporting tool for Joomla! online sales. And the 4 different time frameworks (Days, Weeks, Months and Years) makes it suit to detect tendencies and projections for shops of every size. This tool has also been optimized to work with large online stores.